In part three (part one, part two, part four) we cover Mass Effect 2's galaxy, making every world unique, artificial intelligence, squad behavior, and permanent death in the universe. Game On: Let's talk about influences. Anything in particular that inspired your approach to Mass Effect 2's design and story this time around? Casey Hudson: Well actually, I guess the nice thing about having an established IP is that now our reference can mainly be the first game in terms of differences that we want to establish from it. We're talking less about movie or other references with Mass Effect 2 and more about where we want to go relative to the first one. That stuff's mainly driven by a combination of what we want to do with the high-level story and features, but also what the feedback was on the first game from everyone. We looked at every review that we read and all the forum feedback that we could find. Every point of reference we could find, we literally cut and paste into a huge document and categorized every point and perspective. That became a picture for us of what players and fans wanted to see next. Feature s, improvements to systems, places they'd like to go, people that they wanted to see coming back, things like that. That became our blueprint of what we wanted to do, and then we created a game designed to fundamentally capture those things in a natural way. GO: Besides its trunk story, Mass Effect had a galaxy of optional planets you could explore. Of those, about 90% were represented with superficial text descriptions, while the remaining 10% you could actually land on tended to be mechanically and visually generic. How distinctive are the planets and optional locations this time? What can we expect from planetary exploration? CH: It's completely different. It's based on an approach that's 180-degrees different. Much of what we were trying to do with the first game was to accomplish this experience of enormous scope, and that involved creating a new IP and all of that stuff. Now we're able to look at the feedback, what people wanted, what we want to do differently, and yeah, dealing with planetary uniqueness was one of the big points of feedback. 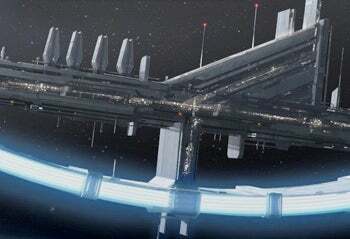 With Mass Effect 2, we actually looked at whether we should simply abandon additional worlds outside of the core ones. We seriously evaluated that, because with the first game, we had all these rich core-story-based worlds, and then we added to that a large number of other worlds you could explore and conduct missions on. But in general, there was a lot of feedback, as you say, from people wanting the optional planets to be more distinctive or unique. So we thought, should we even have this extra expanded universe portion of the game? What we found in evaluating what people were saying, was that they loved the idea that you could look at a galaxy map and find a planet, go out there and find something amazing and explore it. They just wanted more substance and for the whole enterprise to be more interesting. So we've kept all those additional worlds in Mass Effect 2, but we took a completely different tack, which is that every area has to be…every planet that you find out in the uncharted worlds has to be based on its own unique hook. There has to be something different there, an opportunity for you to play with something in terms of gameplay or the story content or whatever's going on at a given location that's different from what you're able to do in the core story. With the first one, we built lighter content but were able to deliver a large number of worlds. In Mass Effect 2's case, by contrast, it's about every area being something amazing and special, so that you see one and you go wow, that was a really cool and different experience. But then the next one is completely different from that, and changes your expectations again about what you'll find. The more you do it, the more you realize that anything can happen in the outer parts of the exploration experience. 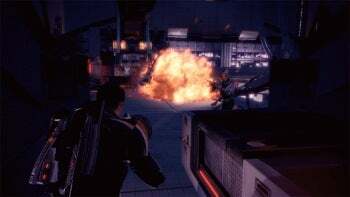 GO: Turning to Mass Effect 2's artificial intelligence, watching some of the E3 2009 combat videos I was struck by how agile Shepard himself seemed to be, but how slow and cover-ignorant the enemy AI was. Will the oppositional AI in the final be more shrewd and self-preservationist? CH: As you hinted, being a demo we've got a short period to get across as many features and moments as possible to describe what the experience is going to be like. We gave the demo operators something like 30 missiles for their heavy weapons, so they could blast through the latter part of the level, whereas in the game those missiles will be a very precious commodity hat you might save to use as the peacemaker at the end of a boss fight. Just to be clear, the AI in the demo wasn't as defensive as it'll be in the final game, but the other thing is, AI's been a huge focus for us. It's already huge improvement, where we are right now with the game, and it'll continue to be something that we tweak. Bear in mind that many of the systems in the E3 demo were actually new additions to the game experience. As such there was no opportunity to tune them so that enemies were more tactically aware. So we'd just added new weapons and abilities in terms of taking cover and so on, but when those things are initially introduced, we haven't had a chance to tune much. The demo's point was to convey some of the things you'll get to do, what the game's going to look and play like. Between now and when we release, the tuning of the AI…it's already a lot more sophisticated than it was in the E3 demo. GO: Speaking of weapons, the demo highlighted something like a gravity missile launcher? CH: It's a fairly conventional guided missile launcher, but when you combine that with the biotic abilities…what happened a lot in the demo, was someone would lift a character and they'd kind of float helplessly up on a zero-G field. Then you hit them witih the missie launcher, which is guided so it tracks in on them. It may hit them from the side or the bottom, and the impact blasts them, because they're floating in zero-G, it blasts them in one direction or another. So that's an example of the combination of these powers and of how it's a lot more physics based this time. GO: When squad members lose health, will they use cover more effectively? When they go down, will they stay down and then automatically "rise up" at the end of battle as in the original? Are they ever in life or death jeopardy beyond narrative scripting? CH: The squad recovery mechanism is similar to the first game. Being able to have squad members knocked out but not dead is one of the fun things about having a squad in the sense that, when you have…it's the difference between a single-character game, where either you're dead or you're not, and then you have to come up with grades for bleeding out and so on, so that you know when you're in trouble and your back's actually against the wall. Similarly here, when one character's down, you know it's time to be really careful. When you're fighting on your own and both of your character's are out, then it creates an even more interesting narrative in combat. We've preserved that, but there's also an IP explanation in the Mass Effect universe. The idea is that your battle suit will make sure you're unconscious if you fall below a certain level of health so that you can be revived versus allowing you to actually be killed. In terms of permanent death, your squad mates don't die in normal combat, because that'd be artificial anyway. If it happened, you'd just reload and play the fight again, because it's too big a deal to lose a major character in the course of combat. That said, the story itself is fundamentally meant to involve the life and death of your entire team and individual team members. That's where the main characters you recruit, including Commander Shepard, can die as part of the main story and you can't just reload and play a short stretch of gameplay to change things. How death works, who dies and who doesn't, is an intrinsic part of the way you play the entire game. Continued in Part Four. Check out twitter.com/game_on for even more game-related news and opinion.